This is a rare example of an 18th century crane badge. 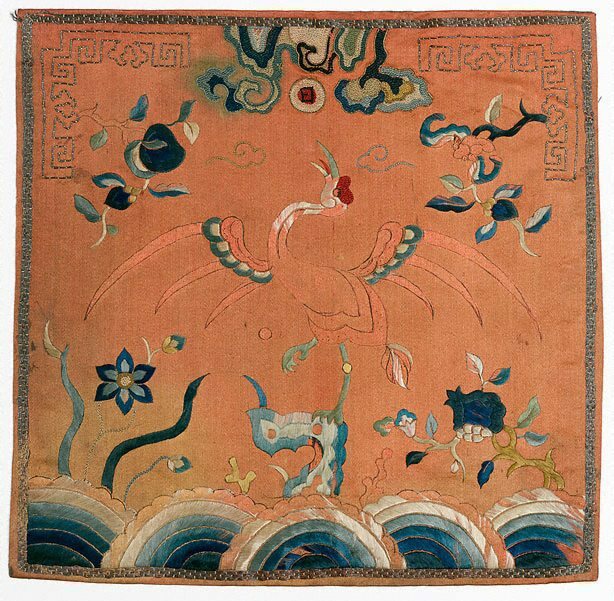 The white satin stitch embroidery on the body of the crane has almost disappeared, which is not unusual in examples of embroidery from Viet Nam where degradation of fibres has occurred due to harmful dye-stuff. The intended design outline of the bird is visible, this is very much in the classic Chinese form, presumably the embroiderer would have added her own stitch interpretations to the pattern. Pomegranate and narcissus are sprouting from the waves on the right and left and two representations of coral are on either side of the rock formation. The design at the top of the badge is quite different from the later badges with an unusual key fret design framing the symbolic images of peaches (longevity) and bats (happiness). The unusual border is composed of three staggered rows of gold-wrapped thread couching which form a brickwork pattern. An illustration of a similar badge can be found in 'Journal of an Embassy to the Courts of Siam and Cochin China' published in 1928 by John Crawfurd. It shows the bird dominating the space which facilitates the easy identification of rank.